3-compartment laundry liquid capsules Mayeri Whites+Colors. 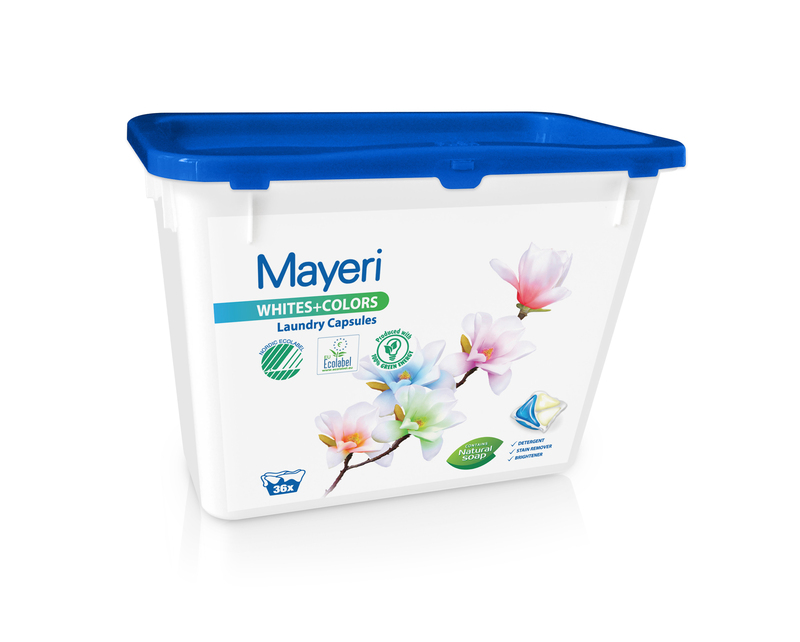 Suitable for washing coloured and white clothes in all types of washing machines. Removes dirt and different stains ( coffee, tea, red wine, fruit juice, tomato puree, mustard, carrot, blood, make up, grass, mud, chocolate) effectively when washing with lukewarm or hot water. Fully soluble, does not leave any residue on laundry or into washing machine. Capsules contains substance (Bitrex), if a child accidentally tried to swallow a product, they would spit it out before it poisoned them. Contains: detergent, stain remover, brightener. One capsule can wash (25ml) full load of laundry (4-5 kg). Product has been granted with EU and Nordic Swan Ecolabel.